Mommy Problems – It's An Adrienne Thing! You may or may not understand. Spread Too Thin: When enough is enough. 7 Intention Filled Actions for a Better You! Is it bedtime yet?? My first venture out with my three youngest children! See me Rolling….with the YogDev Yoga Wheel! Clinton or Trump? It’s TeaBate time! I have yet to announce this on my blog but many of you know from my Social Media Channels that my 5th child, 4th girl, was born about a month ago. (Birth story to come) Since then, I’ve been adjusting to this new “normal”. My two older daughters, from a previous marriage, live with their Dad & Step Mom most of the time. I thought with only three it would be a little easier. Boy, was I wrong! I now am a mother of three kids under 4, two of them are 14 months a part & the youngest is a newborn. Whoa…never thought this would ever happen. Every newborn requires middle of the night feedings. Bailey, my newborn, is pretty good about feeding at night but I need uninterrupted sleep to function. Despite getting up 2-3 times , I’m hanging in there. I am thankful I can sleep until 8 or 9am. My minis are good about that. Usually my husband takes my son to summer camp, or, our babysitter comes to babysit my 14 month old, Skylar, so I could run errands, attend appointments & work. Not today! For the first time ever, I ventured out with the 3 “mini”minis today. Ryan is supposed to be at camp at 9am….that did not happen! He got to camp an hour late. On the way into camp, my Skylar tripped and bumped her head on the pavement. She is fine and only cried for a few minutes. There is now a red bump on her forehead. Next the two girls and I headed to the Post Office. Skylar thought it would be fun to keep running behind the counter while I was taping a package. It took me about 15mins to finish the package because I had to keep stopping to grab her. Now, I know you’re probably thinking that I should have put her in the stroller, well I don’t have a double to fit both car seat for Bailey & Skylar. There was no way I could carry Bailey & the package and push Skylar. Next, we’re off to the Chiropractor. Because of my poor posture due to lack of ab muscles and constant baby holding, my body is compensating with my back thus causing pain. It wasn’t an option, I had to get adjusted! I’m in there waiting, Bailey needs change and fed and Skylar starts to fuss because she was confined to the stroller. Thankfully, I got my adjustment while the receptionist held Bailey Boo and the doc distracted Sky. I would have loved to have stayed for some treatment but it was already time to pick up Ryan. Back in the car we go to drive down the street. Can I just say, I strongly dislike taking the car. I prefer to walk everywhere because 1) I’m moving & burning calories 2)I do not have to keep moving kids in and out of the car and 3) BOB (stroller) requires 0 gallons of gas to cart the kids. Unfortunately, not everything is in walking distance or walking accessible with kids. After searching a few minutes for a spot , I pull in , turned off the car and look back, they are asleep! I was already five minutes late and really did not want to wake them up or take much more time picking up Ryan. Thank the Lord, one of my co workers walks out and was gracious enough to stay at the car and watch the girls. Back home we go but only to clean, cook, clean and cook some more followed by baths, laundry & play time. Oh and I’ve got to get my workout & work in somehow! IS IT BEDTIME YET? I’m exhausted physically, mentally and it is only NOON! How the heck can I do this daily? Sometimes I can’t believe I have six children! So far, God has blessed me with three girls and two boys. Recently, we discovered number six’s gender and want to share this news with you. But first, I do want to be clear that this pregnancy was the only pregnancy not planned. Read the story here. From day one I’d refer to this little one as, “he”. After all I have 3 girls and 2 step daughters, so it has to be a boy, no matter which signs and symptoms were prevalent. I’d ask the other children what they thought “it” was and their initial answer was sister. However, I prepped them all for a baby brother. We went in for the ultrasound and the tech asked us if we want to know the gender. Of course, we said yes but I requested that we were giving a chance to guess the gender from looking at the “parts”. I’ve done this in the past and had the experience. From the moment I saw this baby’s anatomy, I thought “boy”. We finally got to his parts and I saw the “boys”. She asked me what I thought and I shouted, “Boy”! But she did not confirm my answer. I’m thinking, “Um, lady what the heck? I have to be right so could you please just confirm.” Boy, was I wrong! Those “boys” were really “girls” but at different angle. I was shocked. Completely & utterly shocked. 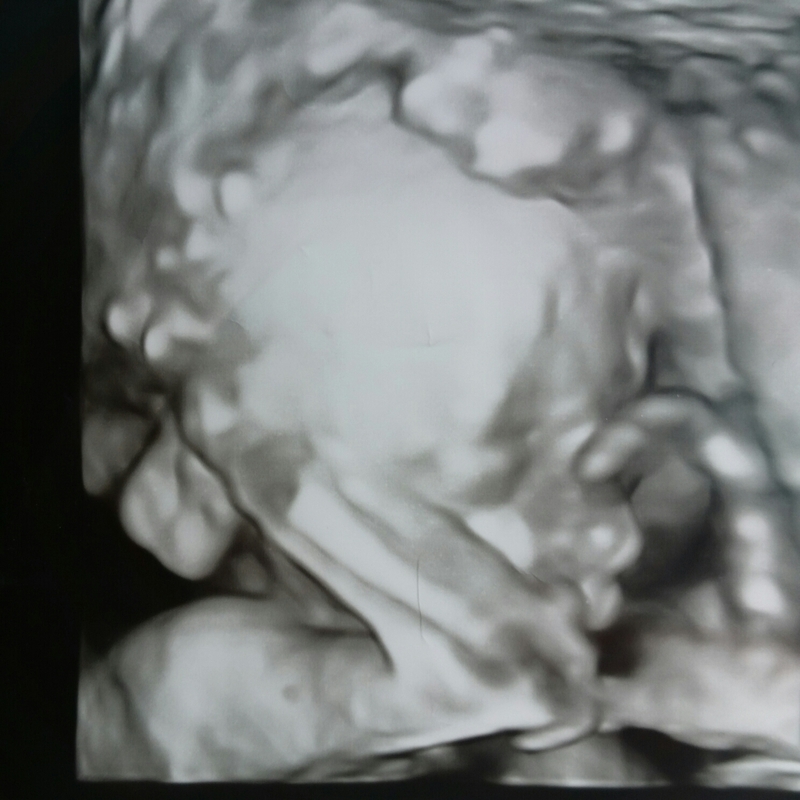 After, measuring and checking the baby’s anatomy, the tech then showed us her actual face in 3D. Once I saw her face, I knew she is momma’s girl #4. Have a name suggestion? We are definitely open to hearing them. I’m all out! I think most of us can agree that life can sure throw some curve balls. I am a mom and have been for over 12 years. I never thought I’d have 4 children. But as that saying goes, “expect the unexpected”. Autumn, Summer, Skylar & Ryan…..My Four Monkeys! Even though I never thought I’d have several children, they were really all planned. Not one of them was unplanned, including my angel baby, Tyler. He would have been number four but passed away at 16 weeks in the womb. Right after having my youngest, who is now 9 months old, people ask would if we are done. I replied, “I’d love to be done but ultimately it is up to God”. I mean, how can I say absolutely not when we should be open to life. Besides, I was ready to restart my fitness journey and move forward with the MMF organization, 110%. Well, God sure has a sense of humor! I try to be a decent Catholic. I expected my period early December and even though I felt like it was coming, it just was not happening. For my piece of mind, I took a leftover unused test from my pregnancy with Skylar – my youngest. I knew it would be negative because I had tracked my cycle and was not showing signs of ovulation. Much to my shock & surprise, it came out very positive. I cried and cried. I called my mother and cried some more and just laid numb on the couch for the rest of the day. For days, I did not believe it and was adamant that this was not real. I felt embarrassed, helpless and alone. I was afraid to tell anyone, including my sisters who are my best friends. After several weeks, I finally decided to go to the doctor. By this time, I was over 10 weeks. This certainly is not too late to go to the OB but with other pregnancies, I’d go as soon as 6-8 weeks. I think a part of me was expecting a false positive pregnancy or a miscarriage. My husband and I went for the first initial visit. My OB/GYN is a practice of great doctors and I’ve had them all a part of a delivery or a procedure. Needless to say, they know me well and I am very comfortable with all of them. For this particular visit, I had Dr. Maute . She has got to be the sweetest doctor ever &I could talk to her for hours. She was with us when when delivered our Angel Baby and has the greatest bedside manners. Dr. Maute walked in the room and just smiled. With a very positive attitude and outlook, she helped ease the tension and fear I had and reassured me everything would be okay. The ultrasound began and I waited to see if I really had a another little life inside of me. 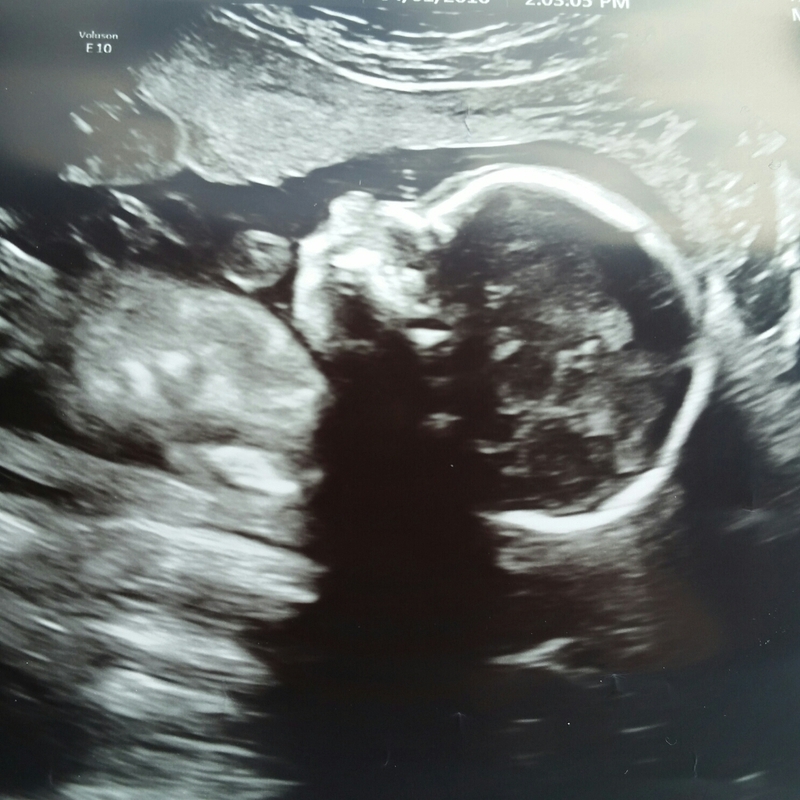 As soon as the ultrasound began…..THERE IT WAS! A strong heartbeat and lots of movement from this little one. After this appointment, I accepted that God has created this life for a reason. Though I’m unsure why, He has the ultimate plan and I’m just going with it. Since the initial prenatal visit, I have been back about twice. The baby is still growing and so is my belly. Am I happy ?? Well, I am happy God has chosen me to carry out His plan. But I’m not going to lie, I’m scared! The WHAT IF’s and HOW’s haunt me daily. Despite my griping and moaning, I do believe these little guys have a reason for being created. It may be a “whoops” on our part but not for God. He doesn’t make mistakes. Have you gone through or are you going through a divorce? Do you have children with your ex or soon to be ex? I sympathize with you and your family. Divorce is hard on everyone involved. I’ve been there as my ex-husband and I were married for nine years with two girls, Summer & Autumn. For various reasons, we both decided it was time to move on. Our marriage was annulled in the Church and legally dissolved. Let me start this off by stating, everything we did was amicable. There was some arguing but for the most part we agreed and found common ground. Especially if it was in the best interest of the girls. In this particular situation, both I and the girls’ father thought it would be best if we kept the girls in the same house and school. We wanted them to have some familiarity and not get too thrown off. My ex husband kept the house and that mean’t I had to give up seeing the girls nightly. We are very blessed to a) get along and b) live near each other so they stay with me often. Not to mention, I know their father loves them very much and would do nothing but the best for them. I also had faith that this was the right thing to do and needed to trust God. Yes, I know many will judge and say the opposite and perhaps even call me a horrible mother. Sure sometimes I feel like it but what I’m about to tell you will confirm my faith & choices. I knew one day the girls’ father would remarry. In fact, I even prayed for the perfect mate for my ex and stepmother for my girls. The day came and I knew my ex had found the perfect women for him. I mean PERFECT!!! This lady bakes- like real goodies, loves kids and animals, is a teacher and a planner. This amazing mother took on & loves my two girls as if they were her own. Do you know she even volunteered to be Autumn’s Girl Scout Leader? Because I only have the girls overnight each week and for one long weekend per month, she constantly keeps me in the loop . We work together for the girls and our sons are buddies too. They are about 18 months apart and my son, Ryan, just adores her son. We’ve had several play dates. I think it is good for the kids to see us all getting along. A Tip from Me: If you are a divorced parent, I want to warn you that you may sometimes deal with the kids playing parents against each other. My suggestion to you would be to take most things your children say, about the other parent, with a grain of salt. Simply just speak to the other parent prior to jumping to conclusions. We have and will continue to experience this with the girls. Especially since Summer is about to be a teenager. What’s Good for the Goose is Good for the Gander. Find What you are searching for!